We love the countdown to Christmas. For many years, Monkey had her own Christmas tree advent calendar that she would hang an ornament on each day from December 1st to the 25th. But since Bo has been mobile, that system was no longer working. Last year I spent more time re-hanging ornaments on their little tree than I did cleaning the house. So this year, I knew it was time for a change. But after searching for several days, I couldn’t find anything that would work for both Monkey and Bo. All the advent calendars were complicated, required supplies I didn’t have, or weren’t kid-friendly. 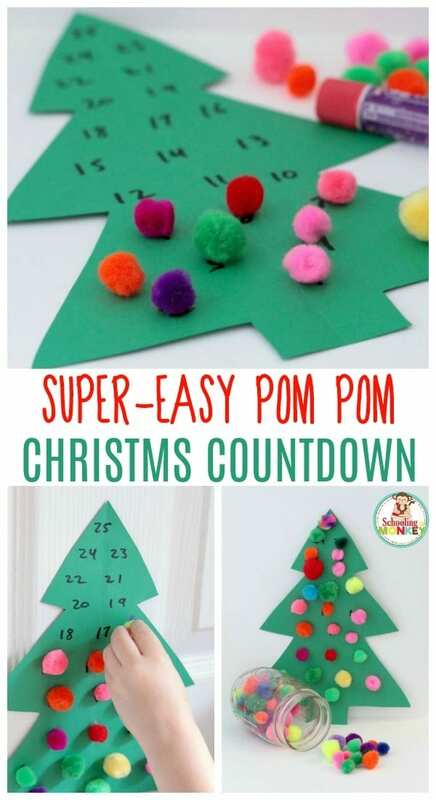 But, when I saw our container of pom poms, I knew I’d struck on the perfect simple Christmas countdown calendar. 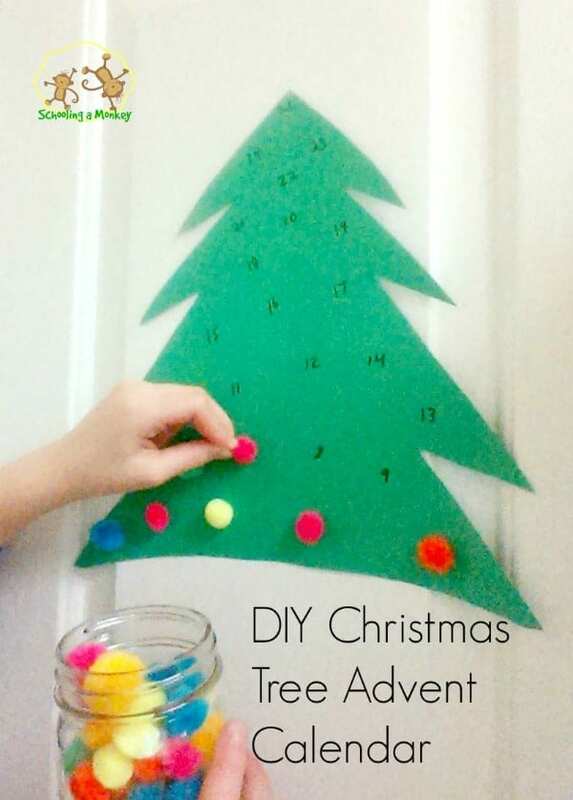 If you also want the easiest, fastest Christmas tree advent calendar imaginable, read on to see how to make your own! 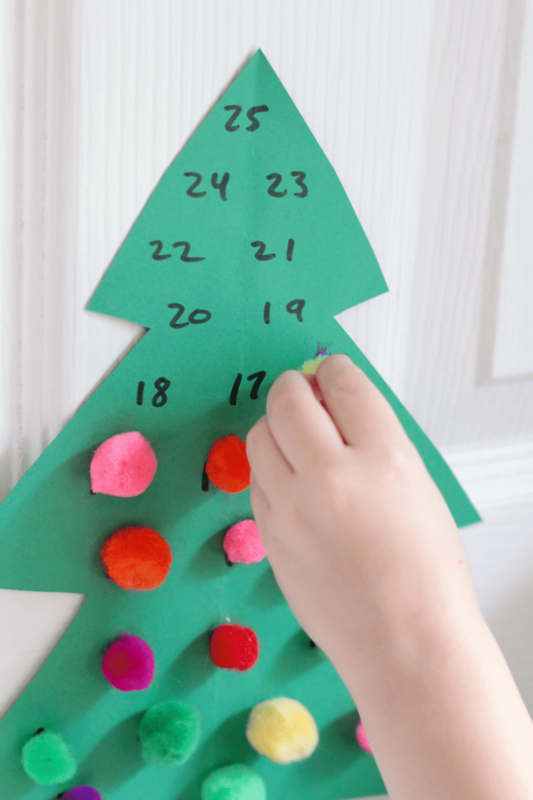 It takes no more than five minutes to make this super simple Christmas countdown calendar! To make the tree stencil, I taped two pieces of paper together to make the scrap paper as wide as the card stock paper. 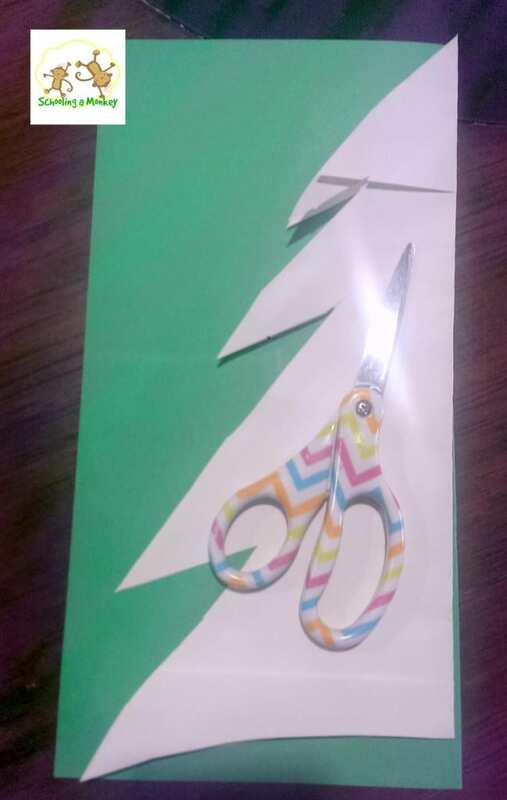 I folded the scrap paper in half and drew half a Christmas tree along the folded edge so that both sides of the tree matched when I opened the paper. When I was happy with the design, I traced the outline onto the folded edge of the cardstock paper. Next, cut out the Christmas tree and open it up. Position the pom poms where you want them to go. 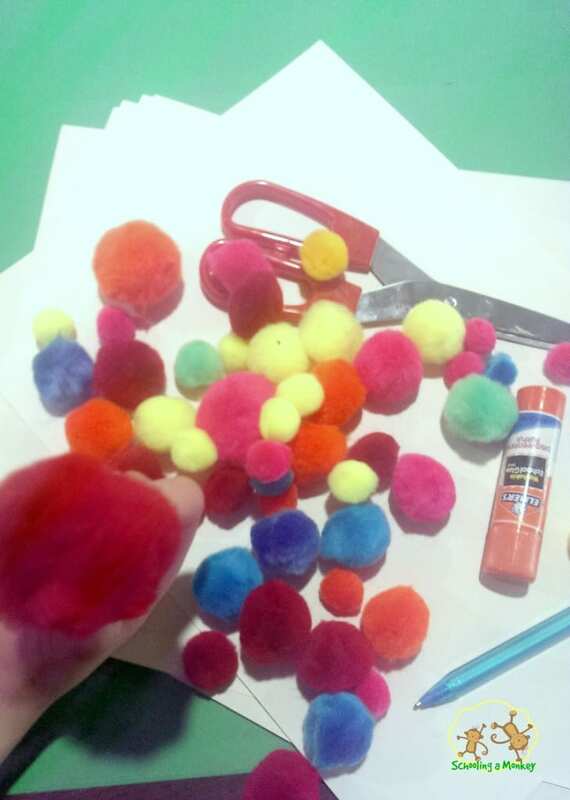 I wanted the children to start at the bottom and work their way up as the month went along, so I spaced the pom poms accordingly. Write the numbers from 1-25 under each of the pom poms. I put number 25 at the top of the tree and worked my way backwards. Tape the tree to the wall. 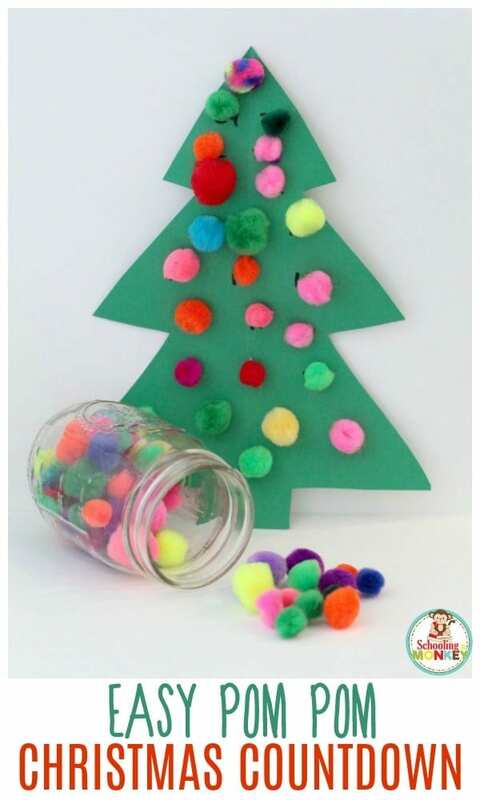 Each day in December, allow the children to glue one pom pom to the tree on the corresponding day. 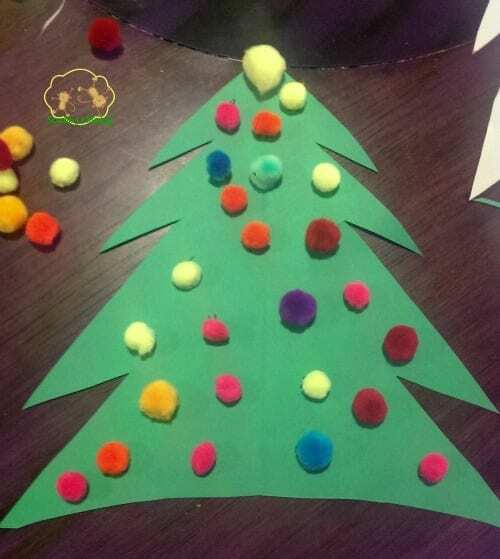 We ended up making two trees to prevent squabbling over who’s day it is to glue the pom pom to the Christmas tree advent calendar. 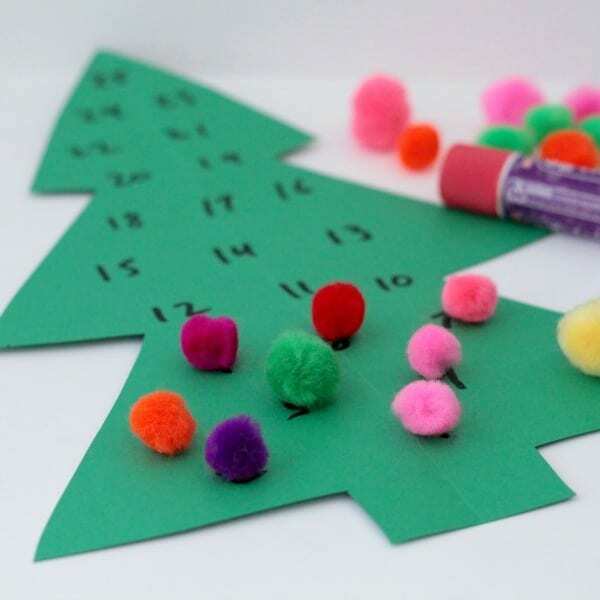 If you make this Christmas tree advent calendar, share your project with us on the Schooling Active Monkeys Facebook page!